A population cannot increase exponentially and infinitely. The size of a population naturally fluctuates but is usually within a certain range, which is determined by a few limiting factors. 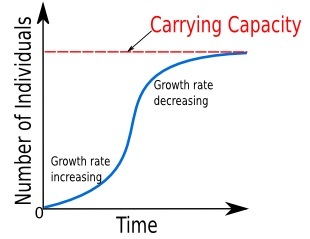 Consider which population limiting factors are dependent and independent of the size of the existing population. For example, cold temperatures can decrease the size of a population irrespective of its size. On the other hand, the availability of nesting sites for birds will only become a limiting factor when the population becomes dense enough. Conservation = Maintenance of existing biodiversity, including interspecies, genetic, intraspecies, habitat and ecosystem diversity. Often involves management of succession. Preservation = Maintenance of habitats and ecosystems in their present condition by minimising human impact.